four × 5 = Required Please enter the correct value. We've selected the top penny stocks to watch in April 2019 for investors looking to profit high and fast. Penny stocks, by definition, trade for $5 or less. What makes them so desirable is that they are a volatile investment – they won't beat the market any given weekday, but when they do, it's quick gains in the double and triple digits. It can be a challenge finding the top penny stocks of the over 2,800 trading on the NYSE and Nasdaq. To help you find the best opportunities, we've put together a list of the top penny stocks to watch now. These are all pharmaceutical companies that performed well in March, but they serve as good illustrations of earnings potential with penny stocks. But heads up: We're also going to give you one stock pick that still has insane market-beating potential. So keep reading. Top Penny Stocks to Watch, No. 5: ConforMIS Inc.
ConforMIS Inc. (NASDAQ: CFMS) is a Massachusetts-based medical device company that focuses on developing, manufacturing, and selling joint replacement implants. It offers custom knee replacement products, such as its iTotal CR, iDuo, iUni, and iTotal PS devices. The company also offers hip replacement products. CFMS shares rose 54.76% to $1.78 during the second week of March. This came after the announcement that Conformis would feature its new 3D-designed hip system as a key technology focus at the upcoming annual conference of the American Academy of Orthopedic Surgeons. These are the kinds of events that set penny stocks on fire. So always watch the headlines for new innovations. Top Penny Stocks to Watch, No. 4: Handcock Jaffe Laboratories Inc.
Handcock Jaffe Laboratories Inc. (NASDAQ: HJLI) is an Irvine, Calif.-based medical device company that focuses on developing and selling biological tissue solutions for the treatment of patients with vascular, coronary, peripheral arterial, and end-stage renal diseases in the United States and Europe. In February 2019, the company successfully began the first in-human VenoValve study, with an implant that was done in Columbia. But shares rose over 66% to $2.35 in mid-March. This was on news that HJLI closed a private placement of 2.3 million shares of stock to raise $2.7 million in fresh capital. So it could be a clinical achievement or just good company management that gives your penny stock a boost. This next stock rose even higher after a successful clinical trial. Top Penny Stocks to Watch, No. 3: Soleno Therapeutics Inc.
Soleno Therapeutics Inc. (NASDAQ: SLNO) is a California-based diagnostic and research company focused on the development and marketing of new treatments for rare conditions. Its leading drug candidate is a treatment for Prader-Willi syndrome (PWS), a rare genetic disorder that leads to a number of physical, mental, and emotional problems. SLNO shares jumped 78.67% to $2.68 during the second week of March on the announcement that the Data Safety Monitoring Board (DSMB) recommended the continuation of the company's phase 3 trial. A 78.6% gain is fantastic, but penny stock successes come in the triple digits too, like our next pick. Top Penny Stocks to Watch, No. 2: Akari Therapeutics Plc. Akari Therapeutics Plc. (NASDAQ: AKTX) is a New York–based clinical-stage biopharmaceutical company. It focuses on developing and selling treatments for a range of rare, inflammatory, and orphan immune diseases. AKTX shares jumped 122.96% to $4.08 during mid-March on positive news from the FDA. The company announced it had a positive pre-investigational new drug (IND) meeting with the FDA regarding the clinical trial program for a drug meant to treat pediatric thrombotic microangiopathy, a rare condition that has an estimated 80% fatality rate. This is what investors can expect from some of the top penny stocks, like pharmaceutical companies with drugs progressing in their approval phases. Hard to believe 122% gain is still not the best performance of the month, though. This next stock was the one to beat in March. 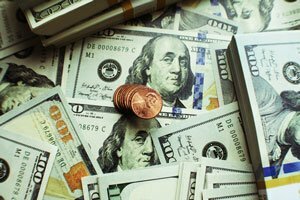 Top Penny Stocks to Watch in April 2019, No. 1: Atossa Genetics Inc.
Atossa Genetics Inc. (NASDAQ: ATOS) is the top penny stock to watch in April based on its performance last month. This is a Seattle-based diagnostic and research company that focuses on developing and marketing new ways to treat breast cancer and related conditions in the United States. In just the second week of March, shares of ATOS soared 130% on news that one of its experimental treatments had received approval from the FDA. On March 14, the FDA gave special approval to the company's drug, Endoxifen, which is a post-mastectomy treatment for breast cancer patients that are pre-menopausal and estrogen-receptor positive. As these returns show, you can get market-beating gains by choosing the right penny stock. While we don't recommend any of these five to buy right now, we do know of one penny stock poised for a breakout. Here it is.